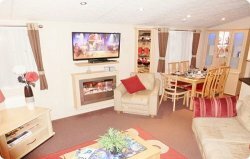 Platinum 3 bedrooms Holiday home at Craig Tara with Patio Doors leading to Full wrap around enclosed veranda (lockable gate). Sea View and Rattan furniture, perfect for sitting out on a summer evening enjoying the sea air. 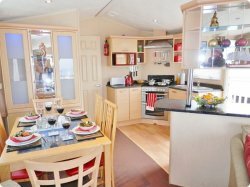 Willerby Winchester (3 bedroom) l (38ft x 12ft) extra wide Holiday Home. It has a Separate WC and Shower Room. Located in Kintyre View (highly sought after area of Park/the Best location on Park) less than 1 minute to beach and only 5 minute walk to Holiday Entertainment complex and Shops. We are not up the hill, we are on the flat. It is fully Double Glazed and has Gas Central Heating throughout. It has a Separate WC and Shower Room. Sleeping 6 in 3 bedrooms (one double and two twin). The Lounge incorporates free standing furniture with co-ordinating armchair and Lava Scape flame effect electric fire. Wall mounted 50inch LED TV, DVD, CD, Free view and stereo are also provided. The lounge also benefits from an abundance of windows that allow natural light to flow throughout the entire Holiday Home, leading from the Lounge from front French Doors to the large veranda. 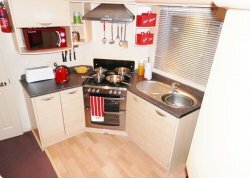 With its distinctive gallery Fully Fitted Kitchen with integrated full size fridge-freezer, stainless steel Gas cooker with combination oven/grill/hob and extractor fan, microwave, electric kettle, toaster, cutlery, dishes etc. Leading onto an open-plan living and dining space with dining table with rattan and glass feature panel and upholstered chairs. 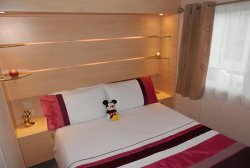 Master Bedroom includes double bed and fitted wardrobes and dressing table. There is a Portable Colour TV. Second Bedroom has two twin beds, wardrobe and drawers. Wall mounted Flat screen TV. Third Bedroom has two twin beds, wardrobe and drawers. Family Bathroom with walk in shower enclosure with thermostatic shower, WC and wash hand basin. 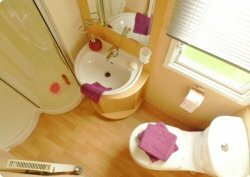 Separate Toilet with WC and wash hand basin. 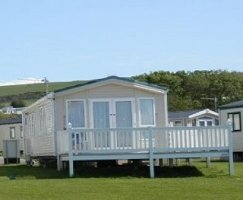 Everything you need for a Great Family Holiday! Location: Less than 1 Minute walk to beach a short stroll (approx. 5 minutes) to the Entertainment Complex, shops and restaurants.